Aquaman is copyright ©2005 DC Comics. 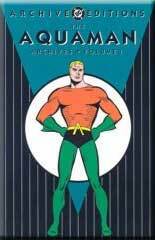 Aquaman appears monthly in comic books published by DC Comics. Smallville and its characters are copyright ©2005 Warner Bros. & DC Comics. This is a fan site and not authorized by the WB or DC. Page copyright ©2005 KryptonSite, unless the material is noted as coming from someplace else or being by an individual author. Photos are copyright to their respective photographers.